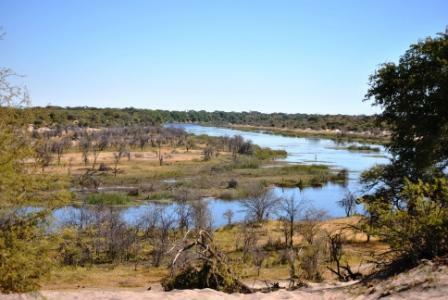 Travelling from Letlhakane in the direction of Maun one travels through miles and miles of arid land that one feels can barely support any animals, then without warning you get the stunning Boteti River. We have visited this river on many an occasion, sometimes just as day trips, we have just gone off the road and found a spot and camped there and we have also often been to Khumaga, which is on the river. It is in the Angolan highlands were the story of this river begins. Rain in the area collects and flows in a south easterly direction and enters Botswana as the Okavango River, which flows into the famous Okavango Delta, 3 months after falling. The delta fills after roughly 6 months after the rainy season and overflows into the Thamalakane River which flows through Maun, before it splits. The one flows into Lake Ngami and the other is the Boteti River. From the split the river heads east and through the Makgadikgadi Pans National Park, then South to the village of Rakops. It then weaves its way to Lake Xai. Which when/if full overflows into the lake at Mopipi and spills into the Makgadikgadi Salt Pans, not far from Orapa. For 24 years, owing to climatic conditions the river did not flow and it was only 4 years ago that it has been flowing again. But has yet to reach Mopipi and the Pans. In Search of a Flowing River. You are certainly opening up my mind on Botswana for me. but I have talked to him about my Landrover v8 last October. The place looks beautiful, and Tiaan has a lot to tell! Not quite sure where you would find such – may I ask why. I would be interested in it as well.